At Story Circle, we spend a great deal of time thinking and talking about the importance of writing our own stories: documenting our lives, our passions, our hopes, our achievements—in journals, memoirs, poetry, drama, song, and autobiographical fiction. I’ve done my share of this personal work. Together, Alone: A Memoir of Marriage and Place is my story about twenty-plus years of life in the Texas Hill Country. And An Extraordinary Year of Ordinary Days is the journal of one year of that life. But I’m also interested in writing the lives of other women, and I’ve done my share of that, too. Some of these are fictional, but some are real, like my eight-book series of mysteries following Beatrix Potter’s life in the years 1905-1913. And if you’ve enjoyed reading such currently popular novels as The Paris Wife (Paula McLain), Z: A Novel of Zelda Fitzgerald Potter’s (Therese Ann Fowler), or Loving Frank (Nancy Horan), you’ve been reading the lives of real women—interesting and thought-provoking lives they are, indeed. Writing a woman’s life is a fascinating project, for many women’s experiences are rich in unexpected secrets, unexplored depths, and unrecognized achievements. I’ve been “working on” one particular woman for the past two decades, and since my novel about her is coming out in October, I’d like to share with you what I’ve learned about this process, illustrated by what I’ve learned about my subject. This is the first of what I expect will be four posts on the topic. I’m writing about Rose Wilder Lane (1886-1968), the daughter of Laura and Almanzo Wilder. She was born in Dakota Territory, grew up in Mansfield MO, and left home at 18 to become a telegrapher, then a reporter and feature writer, a freelance journalist, a world traveler, a magazine fiction writer, a best-selling novelist, and a political philosopher. You can read her full biography here, and a charming short autobiography here, written in 1938 or 1939 for the Works Progress Association (WPA) Folklore Project. I was compelled to learn more about Rose because, as a girl, I loved the eight Little House books, by Laura Ingalls Wilder. No, I didn’t just love them, I adored them. I remember reading them aloud to myself, perched in the catalpa tree outside my bedroom window, loving the sound of the words, the flow of the sentences, the craft of the story, so simple and yet so real and compelling. That they were the work of an elderly woman, living on a Missouri farm, and writing true stories about her childhood (I imagined) by candlelight—why, this made them all the more interesting. One of my teachers called Laura an “untaught literary genius,” and I had to agree. And since I wanted to be a writer when I grew up, I was heartened to discover that someone who hadn’t graduated high school and who had lived all her life on a farm could pick up her pen and write such beautiful books—and get them published! If she could do it, so could I. I pinned her picture on my wall—a little white-haired lady signing her book—and vowed to grow up and write just the way she did. 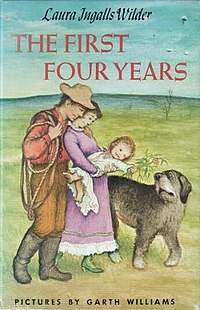 It was a great shock, then, in 1972 or so, to pick up what the publisher called the “ninth book” in the Little House series, The First Four Years, the story of Laura’s and Almanzo’s early years on their homestead and tree claim on the South Dakota prairie. But this couldn’t be the work of the Laura whose books I had read so often that I could recite whole passages from memory! Not to put too fine a point on it, the writing was stiff and awkward, the narrative clumsy, the characters unbelievable. This must have been written by . . . by an imposter, using Laura’s name! By that time—the early seventies—I was studying literature in graduate school, so I had acquired some research skills that I was eager to apply to this new literary mystery. I was going to find out who wrote The First Four Years and why she (or he) had been allowed to put my Laura’s name on this . . . this inferior work! Luckily, there was a brief introduction to the book, and I started there. I learned that, after Laura’s death, the manuscript of The First Four Years was given by Rose Wilder Lane to Roger Lea MacBride, her lawyer and literary agent. Rose—yes, I knew about Rose, Laura’s only child. But the introduction told me things about her that I didn’t know: that she had traveled widely, that she was the bestselling author of many books and magazine articles, and that she had gone to Vietnam as a war correspondent at the age of 78. She seemed to be quite a remarkable woman. And then something occurred to me. What if Rose had written The First Four Years, and not Laura? What if the publisher had put Laura’s name on the book so it would sell better? That would account for the differences, wouldn’t it? But Roger MacBride’s introduction said that the manuscript was in Laura’s handwriting, so that couldn’t the answer. And when I finally managed to find a copy of The Peaks of Shala, Rose’s 1923 book about her travels in Albania, I could see that Laura’s daughter was a highly skilled storyteller with a remarkable eye for description and a strong narrative sense. The Peaks of Shala, in its own way, was every bit as accomplished as the Little House books. And that discovery led me to consider another, even more startling possibility. What if Rose had secretly written—or at least worked extensively on—her mother’s stories, turning them into the Little House books and transforming her mother into a famous author. What if Laura indeed had written The First Four Years but without Rose’s help? It was those two what ifs that pulled me into the research—a long, long learning trail, both in distance and time—that led to the writing of my novel, A Wilder Rose: Rose Wilder Lane, Laura Ingalls Wilder, and Their Little Houses. In my next post here at HerStories (July 8), I’ll tell you about that research. But in the meantime, you might think about a woman who has intrigued you—a relative or a friend, perhaps, or someone you’ve read about and admire. What questions are raised by what you already know about her? What more would you like to learn about her story? What what ifs make you wonder about things she did or might have done? What learning trail would you have to follow if you wanted to discover and write about her life? This entry was posted in On Writing & the Writing Life and tagged A Wilder Rose, Laura Ingalls Wilder, Rose Wilder Lane, Susan Wittig Albert. Bookmark the permalink. Susan, Have you read “The Ghost in the Little House” I think is the name of it. Of Rose being the heavy editor of Laura’s books. The story behind the story is so intriguing, Susan. Thanks for sharing it here and for not letting go of your passion to bring Rose’s story to light. Can’t wait to read the book! Thanks, both Susans–truly, it is a fascinating story. I hope I have done it justice. I worry that publishing it under my own imprint may limit its distribution: getting it out there feels like a BIG responsibility. But I’m also learning more about the publishing business than I could have imagined: from that angle, it’s totally worth it. I am eager to read the book, Susan! Thank you for sharing the process of writing it as well as the process of publishing. Absolutely came to the same conclusions. I applaud your work and know your book will be positive and supportive of both women. Can’t wait to read it! Fascinating! So looking forward to October and release of The Wilder Rose. Meg, it’s interesting: now that I’ve been writing about my disappointment and surprise re: The First Four Years, others have expressed the same feeling. What intrigues me: why we’ve kept this to ourselves, mostly (a few scholars have commented on it). Is it out of respect for Laura–who was wonderful in her own right and should be celebrated for her very real achievements? Or is it fear of being the only one to say that the empress has no clothes? I remember having the same reaction as you over the First Four Years- but I didn’t really think too deeply about it as a kid. The more I read about Rose, the more intrigued I am by her. Laura’s family were pioneers in one way, and Rose carried on the tradition by being a pioneer in, what seems to me to be, several ways. I love hearing the story behind your book, it adds so much more to it for me! I’m glad I was in grad school, sharpening critical reading skills, when I read The First Four Years. That made it easier for me to ask “What is going on here?! ?” If you compare Laura’s manuscript to the printed text (I have) you can see that somebody (Roger MacBride or a Harper editor) has tried to do what Rose did on the other books: fix it up. And not very successfully, either. yes, thanks for sharing the backstory to this project, Susan. your pursuit of the truth is inspiring, and though the book is fictionalized, it will be an important acknowledgment of Rose’s huge part in the Little House phenomenon. I think she would be proud and glad for that. Julie, that book (Extraordinary Year) presented so many writing challenges that I almost gave it up several times during the course of the year. Interesting: now, I remember that year so much better than any other year of my life, because it was so intensely and personally documented. I even remember the books I read that year, because I wrote about them and made lists of them! Fascinating story, Susan. I’ll look forward to reading your book, even though I was not introduced to Laura Wilder’s stories when I was young. I am reading your book, An Extraordinary Year in Ordinary Days, and I am so enjoying it. I find you and I have every similar histories and sentiments. 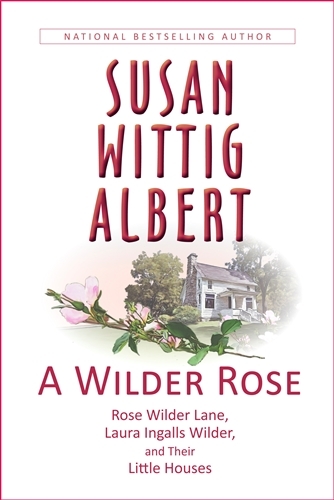 Ah, what a tangled web……looking forward to reading A Wilder Rose very much, Susan. It was tangled, Linda–and all the more interesting because both women went to such lengths to conceal their collaboration. Thank you for sharing with us. I love Laura Ingalls Wilder. I look forward to reading your book. Posing and responding to “What if” is central to any creative process. Thanks for tracing this out for us. I am so looking forward to your RWL/LIW novel this fall–in anticipation, I’ve been reading some of Rose’s works and I am impressed (not with her philosophy, but with her writing skill). LH books are hardwired into my psyche, and I felt much the same as you describe after reading First Four Years. Jane, I’m so glad you’re reading Rose’s writing! She deserves to be read–and to have her best work (in my opinion, the LH books) acknowledged. For me, it’s an issue of fairness–and I have a difficult time understanding why readers would NOT want to know who to thank for the books that, as you say, are “hardwired” into our psyche! Susan this is terribly exciting! I can’t wait to read your book. Like you and so many others, I too adored the Little House novels, reading and re-reading them over and over again. Who could have guessed that behind their sweet simplicity lay such webs of intrigue? Bravo to you for following the threads wherever they led and for never giving up on the trails they created for you to follow! Edith, I have the feeling that there are webs of intrigue in most women’s lives–the trick is to find them and tell those stories. And yes, persistence is the key. We just have to keep working and thinking and caring about a story until it emerges. Maybe “caring” is the most important word here, Edith–do you think? If we care enough about a story, we’ll have both patience and persistence. I think maybe a lot of stories don’t get written down because nobody cares–and that’s sad. Did research become easier with the Internet? Nan, yes–in the sense that the Internet made it easier to track some documents and to locate people I needed to contact. But Rose’s papers are in the Herbert Hoover Library, so I had to go there to do the necessary primary research. I’ll write about that in the next post in this series. I’ll be interested in reading it. Wow, this is so interesting, Susan. My own work has meant that I look into the past of women and men and try to decipher what happened and what might have happened in their lives. And how their stories fit into the greater story, or history. I’m working right now on a women’s history called “Ladies of the Canyons” for the U of AZ Press and have spent the last 2 years digging out the letters, diaries, and oral histories associated with my four main characters. Most women left so little about themselves — I’m researching women who came to the Southwest before WWI — and their stories are often told through others. And that can be part of the problem. I’m delighted to have connected with Story Circle. I’m a late-comer, I know! I have a lot of catching up to do…thanks for your hard work gathering all these women writers together and providing a wonderful forum to share work and life.